After winning a lifetime supply of delicious Angelo Parodi Sardine Portoghesi All’Olio di Oliva, I thought I was going to be on easy street for the rest of my life. On the contrary, I had no idea how many old “friends” would suddenly show up looking to get a taste of my haul. Here are six old acquaintances who came out of the woodwork as soon as my pockets were overflowing with wads of tiny fish. 1. My college roommate, Mark Ericson: Mark basically acted like I didn’t exist back when we lived in the same dorm freshman year of college, but I guess all it takes is a few thousand pounds of premium Angelo Parodi Sardine Portoghesi All’Olio di Oliva for someone to completely change their personality on a dime. Suddenly, Mark accepted the Facebook friend request I sent him nine years ago, he’s trying to get the only existing picture of us trending on Twitter with the hashtag #AngeloParodiSardinePortoghesiAllOliodiOlivaBoys4Life, and he keeps offering quotes about our “incredibly formative friendship” to our college newsletter for their upcoming story “Alumni Wins Sardine Contest.” Mark can try to rewrite history all he wants, but if he thinks he’s getting even one tin of Angelo Parodi Sardine Portoghesi All’Olio di Oliva, he’s got another thing coming. 2. My old bandmates: The last time I saw anyone from my old Pearl Jam cover band was when I was dramatically kicked out and told to never come back after I missed too many shows to care for my elderly pet tarantula. 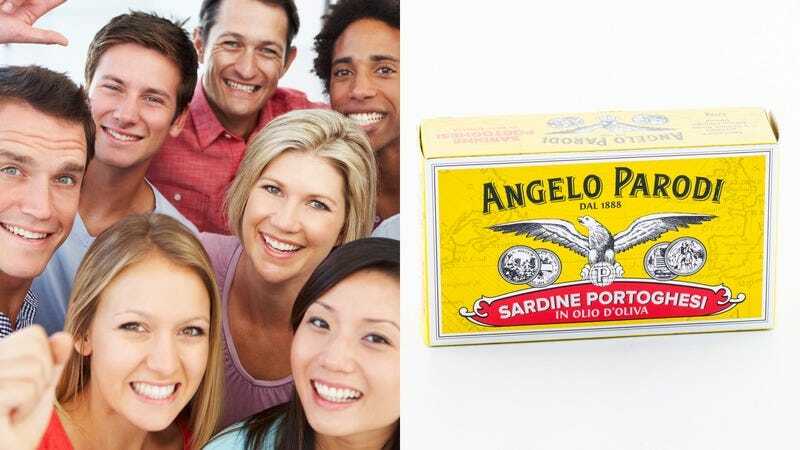 Well, it turns out that, in addition to being a great source of Omega-3 fatty acids, Angelo Parodi Sardine Portoghesi All’Olio di Oliva also has the power to shorten people’s memories! Mere days after I hit it big in the sardine department, all four original band members came crawling back to my door hoping we could run through “Jeremy” like old times to the “smooth backing track of southern Mediterranean fish broiling to perfection” as if I had forgotten them screaming, “You’ve chosen your tarantula over Bellow Ledbetter for the last time!” at me not so long ago. I saw the Tupperware containers hidden in their guitar cases and told them that the only kind of music I make now is the perfect symphony of flavors in my Angelo Parodi Sardine Portoghesi All’Olio di Oliva smoked paté, of which I don’t intend to share a single bite. 3. My first love, Kim Johnson: When I look into Kim’s eyes, I don’t feel like a big hotshot with an unlimited amount of Angelo Parodi Sardine Portoghesi All’Olio di Oliva at my disposal; I feel like a kid with a regular amount of sardines who just wants to love and be loved in return. Perhaps that’s why I pushed away my doubts when Kim, my crush since high school, suddenly decided she wanted to “hang out” after years of ignoring my Facebook invites and “Happy birthday” texts. Unfortunately, the reason for Kim’s change of heart became all too clear when I went to bed one night with the love of my life in my arms and 300 crates of Angelo Parodi Sardine Portoghesi All’Olio di Oliva in my garage only to wake up the next morning completely alone with just 297 crates of Angelo Parodi Sardine Portoghesi All’Olio di Oliva in my garage. Lesson learned—it’s lonely at the top. 4. My sixth-grade basketball coach: Interestingly, when I was an awkward 12-year-old with a horrible free-throw average, my basketball coach, Devon Gherrity, would only refer to me as “Princess Butterfingers,” but now that I have enough Angelo Parodi Sardine Portoghesi All’Olio di Oliva to feed a small island nation, Coach apparently remembers me as the “single greatest player in the history of the team.” In fact, he even said he’d consider “honoring my legacy” by putting my face on the official team jersey if I was willing to hand over just a small percentage of my Angelo Parodi Sardine Portoghesi All’Olio di Oliva cache. I guess for Coach Gherrity, it doesn’t take hard work and perseverance to become a good basketball player, it just takes enough sardines. And frankly, that’s just sad. 5. My pediatrician: No more than a week after my apartment became a veritable emporium of Angelo Parodi Sardine Portoghesi All’Olio di Oliva, I received a phone call from my childhood pediatrician urging me to come in for an “emergency appointment.” When I arrived, Dr. Jacobs said that my blood work indicated a deficiency of vitamins D, B2, and B12 as well as early signs of cardiovascular disease. “That’s weird, because a healthy diet of Angelo Parodi Sardine Portoghesi All’Olio di Oliva should specifically prevent all of those conditions,” I said. Dr. Jacobs gasped and said, “Oh my goodness, you’re right! I totally gave you MY charts by accident. Looks like I’m the one whose health could benefit from an increased amount of nutritious Angelo Parodi Sardine Portoghesi All’Olio di Oliva.” Then he kept loudly repeating that he felt faint until I had no choice but to fork over one of the 17 tins I carry on my person at all times. How silly of me to think that my old doctor might actually be concerned about my health and not just thinking of his own twisted way to get his hands on a piece of the Angelo Parodi Sardine Portoghesi All’Olio di Oliva pie. How sweet…not! Even if his play for my sardines wasn’t so desperate, it hurts that David didn’t even mention my years in the Peace Corps or my extensive work with shelter dogs. I’m not just a walking piece of Angelo Parodi Sardine Portoghesi All’Olio di Oliva, David! I have feelings!